This is an interesting experience for me. I love the poetic beauty of these words, but I am wrestling with allowing that to be in my heart. I was actually attempting to find a different quote to ponder and muse upon today but as it is meant to be…I continually found myself being pulled here. So bear with me (or not) as I meander through my current space of resistance. I believe that we are divine beings with Divine Love and presence within. I believe that we are here to learn to love as deeply as we are able, starting with our very own self. I believe we have all been graced with unique talents and gifts that we are to foster and use to serve the highest intention of all. I believe that we are to offer ourselves the affirmation and acceptance we crave instead of seeking it from others. I believe we are called to honor our beliefs regardless of what others may think of our choice. I believe we can bring calm within by trusting our connection to Divine Love and that anxiety builds when we feel separate. But where does human connection fit within this? What am I holding them accountable for instead of holding myself accountable? What acknowledgement of my story am I waiting for before I can move forward? What validation of my choices am I seeking in order to feel accepted? Why is there a desire for my truth to be known and understood by others? What wall am I inadvertently building to keep people out? There is definitely a difference between someone supporting my needs versus fulfilling my needs. I know and respect this. Yet even still, is there an expectation around the support I am seeking? What does support look like to me? What do I seek from a spouse? A friend? A family member? I can say that for me, support does NOT including fixing…me…the situation…anything. I want to be heard. I want to trust that my vulnerability will be received. I simply want someone to be with me. With that being said, am I offering those things to myself? Am I listening to what I really need? Am I really being vulnerable with myself and saying what I need to say? Am I really able to receive that level of vulnerability with gentleness and love…judgment free? Am I really able to be with myself? Although I didn’t necessarily get to an answer around the human connection piece, I can see where my resistance came from. I can see that there are things I have experienced that have influenced who I am today that are coming to the surface to be healed; stories from the past that carry a lot of emotional heft that need to be seen through a lens of love instead of judgment. I am being lovingly nudged toward learning the lessons and receiving the gifts of these experiences. And I am the only one who can say “yes” to this invitation. The magic is in the “yes”. 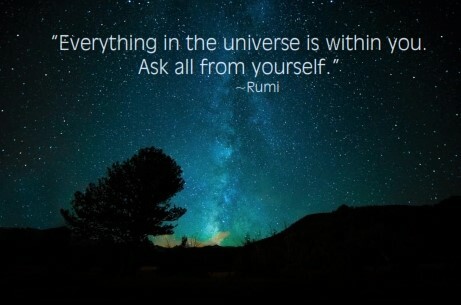 The universe is in the “yes”. I am in the “yes”.